Contrary to what you might hear from some medical professionals, going deep in full squats is a spectacularly good idea, writes Coach Mark Rippetoe, co-author of Starting Strength and owner of Wichita Falls Athletic Club/CrossFit Wichita Falls. Oftentimes orthopedic surgeons, athletic trainers, physical therapists, and nurses are administering bad advice when the conversation turns towards squatting. Most people have absolutely no idea what a full squat even is, much less how they affect the knees, unless they have had additional training beyond their specialties. 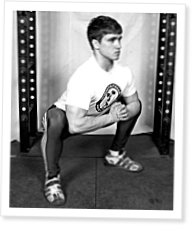 The squat referred to here is the full, below- parallel squat where the top of the patella and the iliac fold (the crease in the shorts that defines the position of the hip joint) form a plane below which the hips must drop. The problem is that one profession does not recognize that the other has something to offer. Strength and conditioning professionals, with decades of experience in getting people strong, might know more about squatting than people whose training has been in the treatment of injuries and disease. The Press is the oldest barbell exercise in the gym but its value is underappreciated, Mark Rippetoe writes in part 3 of his series on the slow lifts. Curmudgeonly barbell expert Mark Rippetoe is not given to subtlety—which is a very good thing when you’re learning how to squat. Couldn't even keep reading the article for all the sarcastic comments and negativity re: healthcare professionals. I'm sure the article made excellent points, but who wants to read a science based article where the author is on a soap box the whole time? Point made, doctors and PT's don't know "squat", but you certainly didn't effectively educate anyone else on it either. Just stick with the facts, it would make for a much better read.